Conservative talk radio 77 WABC finds Occupy Boston to be “very reasonable.” Click here to listen to the conversation they had on air with Stephen Squibb, a member of the Occupy Boston Media Working Group. Metacomet Books, in collaboration with the Boston Radical Reference Collective and the Simmons Progressive Librarians Guild, has established a new, leaderless, collective library at the Occupy Boston encampment in Dewey Square. The yet-to-be-named library is open to the public 24 hours a day and will be serviced by librarians whenever possible. The library aims to provide high-quality, accurate information to all interested parties. The collection contains material on topics such as political theory, social movements, activism, history, philosophy, religion, finance, consumerism, gender, and race, as well as a large fiction section. The library has an open lending policy and visitors are encouraged to borrow materials and use them in and out of the library. Borrowers are also strongly encouraged to return books when they are finished with them so the information can be shared with other people. Donations are welcome, particularly of works on political theory, social movements, activist handbooks, and other material relevant to the Occupy Boston movement. Currently, the library needs daily newspapers, floorboards, extension cords, clamp-style and portable lights, and internet-ready laptops. The entire Occupy Chicago camp and a contingent of Occupy Wall Street protesters who are currently occupying Washington Square Park are both facing imminent eviction by police. Please check out their livestreams here and here and their Twitter feeds here and here. We stand in solidarity with our sisters and brothers in Chicago and New York, as they have stood with us. We are the 99%, united. Governor Deval Patrick stopped by the Dewey Sq. 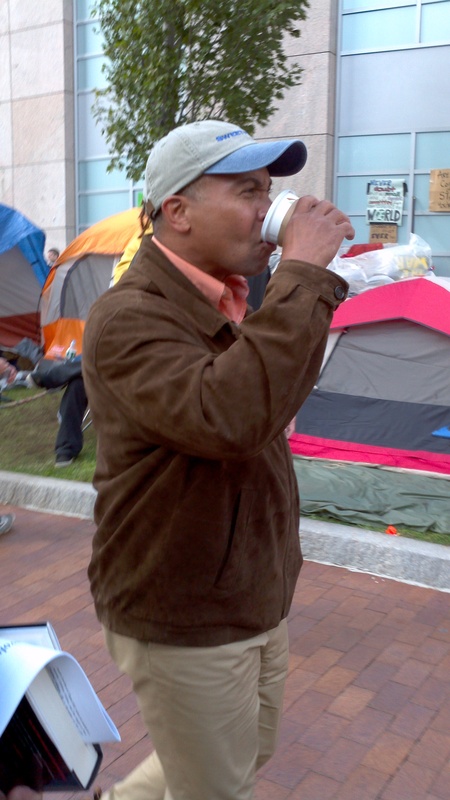 Occupy Boston site this morning for a tour, during which he spoke with occupiers and protesters. He was met with hugs, cheers and handshakes as he wandered the tent city, although his visit wasn’t without what the Boston Globe called “jeers” and shouts. Occupiers said it seemed like the governor learned a lot and seemed impressed with the camp’s logistical setup. “There are people here representing the hard left, the hard right, and everything in between,” Patrick said. The Boston Phoenix and the Boston Globe have more pictures of Gov. Patrick, dressed casually and drinking a cup of coffee.